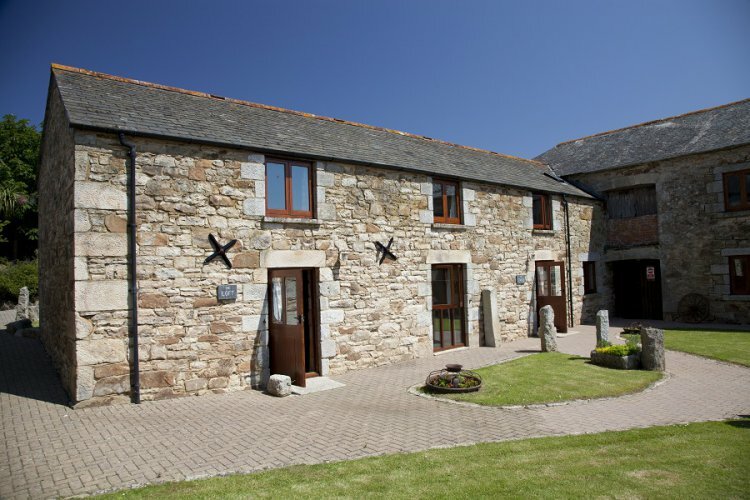 The Loft is one of two wonderful stable conversions that sleeps up to four, set on a peaceful farm just outside the village of St Newlyn East; near Holywell Bay. Working horses would have been on the ground floor with the loft above used to store their feed, now renovated to provide a comfortable base for exploring this popular part of Cornwall. After day trips into Newquay or spending the day in Holywell Bay, you know you can come back from the hustle and bustle to relax in the countryside. There’s so much to see and do nearby; you can walk down to the Lappa Valley Steam Railway for a ride on the miniature steam trains through the beautiful country scenery. The National Trust’s Trerice House is also very nearby with excellent gardens and historic rooms to explore. If you fancy beaches then you are spoilt for choice, the large sandy bay at Holywell is less than 10 minutes easy drive and Newquay is around 15 minutes drive where there are many beaches, shops, pubs and restaurants. The nearest village, St Newlyn East, is less than a mile away and has a convenience store and The Pheasant Inn which offers home cooked food and real ales. Entered from a large communal courtyard, with a well-kept garden and lawn area, into your private ground floor hall with both en suite bedrooms off. The main bedroom has a double bed, built-in storage with hanging space and shelves and bedside tables with lamps. In the en suite is a shower, toilet and handbasin. Bedroom two has twin 3’ single beds also with built-in storage space and bedside tables with lamps and its en suite also has a shower, toilet and handbasin. Upstairs are the open-plan kitchen, dining and living room where the character features continue with the exposed wooden rafters and wooden floorboards. The living room has two sofas, TV with Freeview and a DVD player. Two windows at the front look out over the courtyard below and onto the countryside beyond. The handcrafted kitchen is equipped with an electric oven, 4-ring hob with extractor over, dishwasher, fridge, small freezer, washing machine, microwave, kettle and toaster. The dining table has a bench and two chairs to seat four. As well as the courtyard garden there is a further, more spacious shared outdoor area available for sunbathing and playing games on the large lawn. There’s an old millstone where you can use disposable barbecues as well as picnic benches and this area has far reaching countryside views. Also outdoors is a storage room for bikes, surfboards and wetsuits etc with a washing machine. The Loft is semi-detached with The Stable, also a holiday let, next door. Both properties have thick walls and the outside spaces are the only shared areas as described. Trendrean Farm is a working farm and there may be farm machinery moving around from time to time. If you wish to know more, please don't hesitate to contact us. Rental includes: bedlinen, towels, WiFi, electricity, central heating and parking. The Loft is part of the Trendrean Farm Barns family of cottages, the other cottages are displayed below.